Hey guess what? It’s almost the ‘fall’ season! It definitely doesn’t feel like it here in Dallas (temps are still hovering at 100 degrees every day… yeesh) but according to my capsule wardrobe schedule, it is time to swap out my summer clothes for more transitional pieces. I went through my closet and chose my items that I’ll be wearing for the next 3 months! I also bumped up my number of items to 40. I used those extra spots for 2 extra pairs of shoes and an extra top. It was impossible to find all of the EXACT items that I have in my closet online, so I found ones that are extremely similar. Like the black dress- I have one that is SO SIMILAR and also from Target, but I bought it 2 years ago, so it was no longer on their site. Again, I didn’t include accessories, scarves, tennis shoes, or workout clothes in my items. Are you going to join me? Go through your closet and pic out your items! Go do it! Right now! I know you’ll be surprised at just how much variety you can get with your outfits over the next 3 months. Let me know if you decide to do this along with me! Happy ‘fall’ everybody! Happy happy Friday everyone! This has been a very interesting week with lots and lots of rain. So much rain. I keep forgetting to wear/bring my rain boots to work and it was a horrible decision every day. Work for me was a roller coaster- one day I was super busy, and the next day it was a struggle to find things to keep busy with, and then the day after that was busy and stressful all over again… I am just so glad it is the weekend again! Here are my 5 things to share for the week! 1. Charcoal Face Mask– I tried a new face mask this afternoon and LOVE IT! It is a charcoal and black sugar polishing mask and my face feels amazing! You put it on your face, let it sit for 5 minutes, spend 2 minutes rubbing it in, and then rinse it off. I definitely felt like Bert from Mary Poppins with soot on my face and I also got some in my hair, but oooh my face feels so polished! 2. I stopped at Target on my way home from work today and found the best new jacket! I had been needing a new light jacket for those transition days where it is chilly enough for an extra layer, but not cold enough for an actual coat. 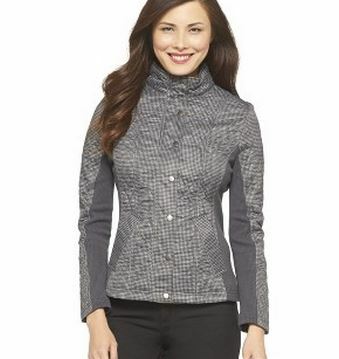 This one is perfect and comes in quite a few colors- I got the grey with a little tiny houndstooth print! 3. This video made me laugh out loud. It is just so fun and makes me wish that I lived somewhere where I could hail a cab. 4. 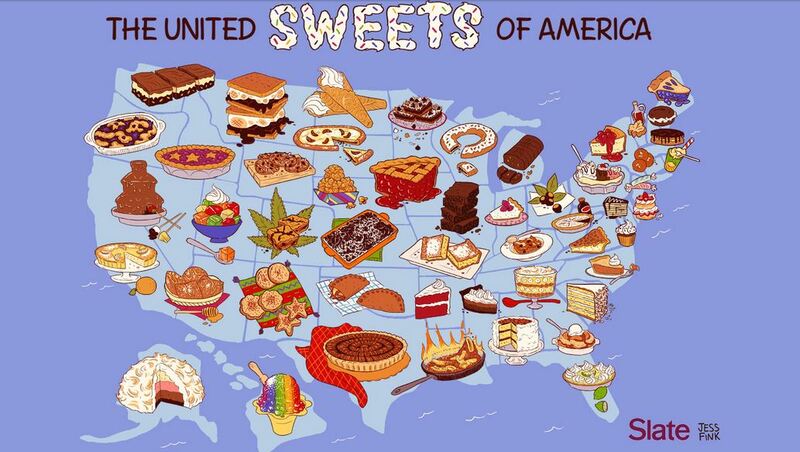 United Sweets of America– This map is the best! My state (Missouri) got gooey butter cake. That is absolutely correct. Gooey butter cake is so delicious and more specifically is a St. Louis staple. In fact, a lot of people outside of St. Louis have never even heard of it, let alone tried it. I remember trying to explain it to my college roommate freshman year and she just didn’t understand. So sad. 5. Speaking of gooey butter cake… you should try this recipe for gooey butter cookies. I have made these multiple times and they are always a hit! It has the same great taste as the gooey butter cake we all know and love, but in a portable, hand-held cookie. And it uses a box of cake mix as the base of the recipe- it doesn’t get much easier than that! Happy Friday! Real quick- today I’ve officially been back living in St. Louis for a YEAR and that is crazy. More thoughts on that later, but now here are five things on my radar from this week. Go. 1. This hair-curling tutorial changed the game for sure. (Also Amy from Karmin is just adorable to watch and listen to!) I’ve been curling my hair this way for about 3 years now and not only do the curls last for days, but I get compliments every. single. time. Give it a try! 3. My new favorite shoes. I’ve always loved wearing a good pair of Converse (I literally wore out my black pair. They fell apart and I had to throw them out and it was so sad.) and these slip-on Chucks are amazing. They are so comfy and have become my go-to weekend shoes. Click the pic and get yourself a pair! 4. You should probably sign up for Groopdealz right away. You’ll get e-mails with daily deals on decor, accessories, and clothes, and I really mean DEALS. I’ve purchased quite a few of my favorite necklaces from here and even a few odds and ends for my apartment! 5. I feel like I need a bicycle. A good majority of my friends have them and I just want to go on bike adventures with them! And plus, how adorable is this one?!? Well hello, Friday, it is sure nice to see you again! What has been on my radar lately, you ask? Well let me share some pretty cool things with you..
1. theSkimm. I’ll be the first to admit that I am not the most informed person in the world when it comes to news and this daily email definitely helps. Their tagline is “We read. You Skimm.” and that pretty much sums it up. They break down the big news headlines in sassy, easy to digest paragraphs (yes, I said sassy) and you won’t regret seeing it in your inbox each morning. Go sign up for it. Right now. 2. Very Mary Kate. This short video series is an oldie but a goodie in my book. My friend Allison introduced me to VMK during college and it provided so much laughter! The videos follow the (not so) true life events of (a fake, but hilarious) Mary Kate Olsen and all the people that come in and out of her life: Ashley, Bodyguard, Fat Professor, and a lot of pictures of bagels. 3. White pants. 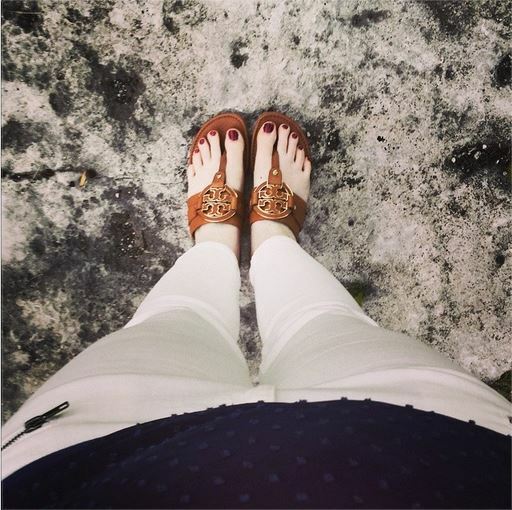 Now that it is past Memorial Day and the summer season is here, it is time to bust out the white pants. I just got these bad boys about a month ago and couldn’t wait to wear them! I was pretty positive that I would spill EVERYTHING on myself today simply because I was wearing white, but somehow I didn’t spill a single thing. Go me. 4. 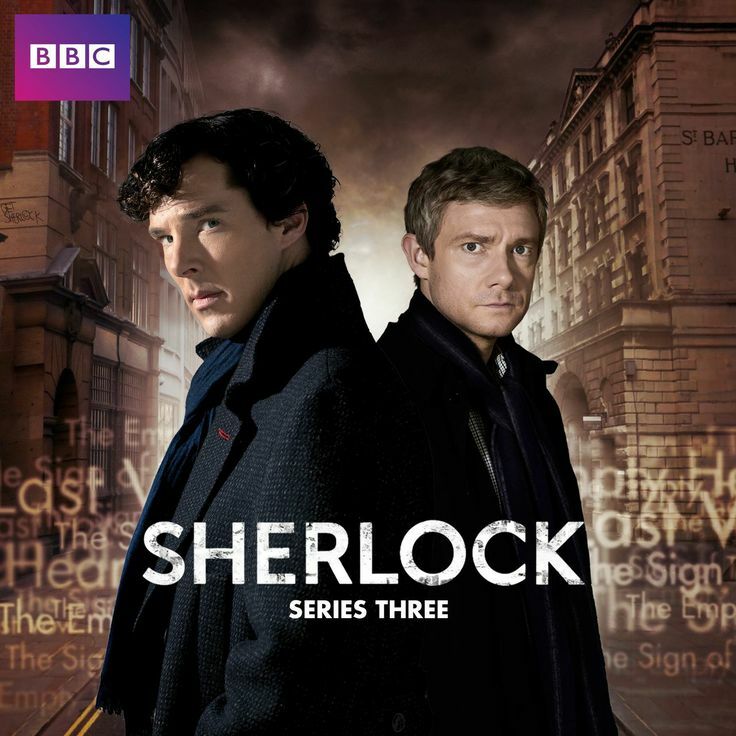 Shelock series 3 on Netflix. I watched the latest season when it came on PBS here in the States and LOVED it just as much as the first two seasons (maybe even a little bit more. I mean, how hilarious was the scene from the stag night?!?) and it has finally been released on Netflix for streaming! So that has been occupying my free time/background noise for the last few days. And I am more than ok with that. 5. Cheez-Its. Just the deliciousness of Cheez-Its. Specifically the Cheddar Jack flavor. Let’s all just take a moment to appreciate Cheez-Its. Thank you and you’re welcome.